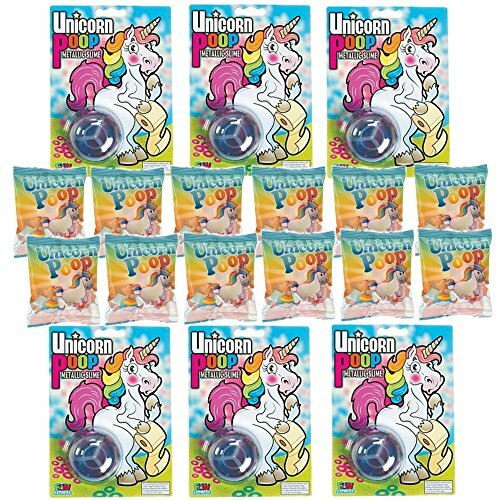 Unicorn Poop Marshmallow Candy Fun Pack (12 packs) + Unicorn Poop Metallic Slime (6 pcs), Unicorn Theme Birthday Party Favor Set, Treats Give Away or Gifts for Loot Bags or for Prizes (18 ct total) by Oriental at WP Ultimate Social. MPN: IN-13704443 IN-13782033. Hurry! Limited time offer. Offer valid only while supplies last. UNICORN POOP MARSHMALLOW CANDY -12 small bags (3x4 inches each) of marshmallow, individually wrapped. UNICORN POOP METALLIC SLIME - 6 pieces of Shiny, glittery and metallic multi-colored slime in a 1" x 2" diameter container each. UNICORN THEME BIRTHDAY PARTY - perfect favors, give away, gifts to put inside your loot bags, or prizes for your Unicorn Themed Party. Perfect too for Lularoe party. If you have any questions about this product by Oriental, contact us by completing and submitting the form below. If you are looking for a specif part number, please include it with your message.